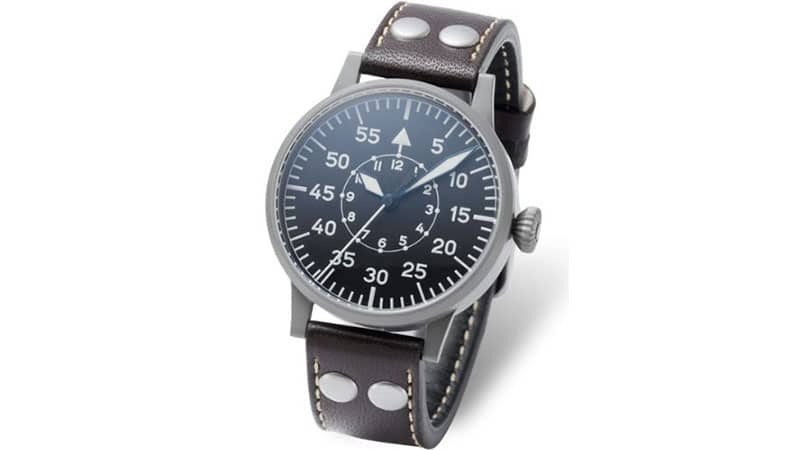 Inspired by aviation, pilot watches are handy for their impressive features and novel designs. Uniquely stylish and highly functional, these terrific timepieces are adept at both keeping precise time and looking great on your wrist. As such, they make a worthwhile addition to any gent’s collection. 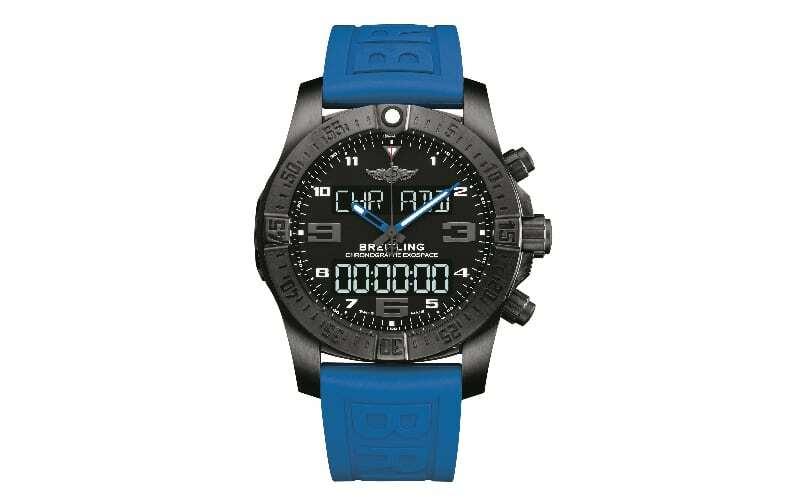 So, if you’re a high-flying man who’s looking to take to the skies, either literally or metaphorically, this is the watch for you But, how do you know which to choose? Well, we can help. Here’s our roundup of the best pilot watches to buy right now. 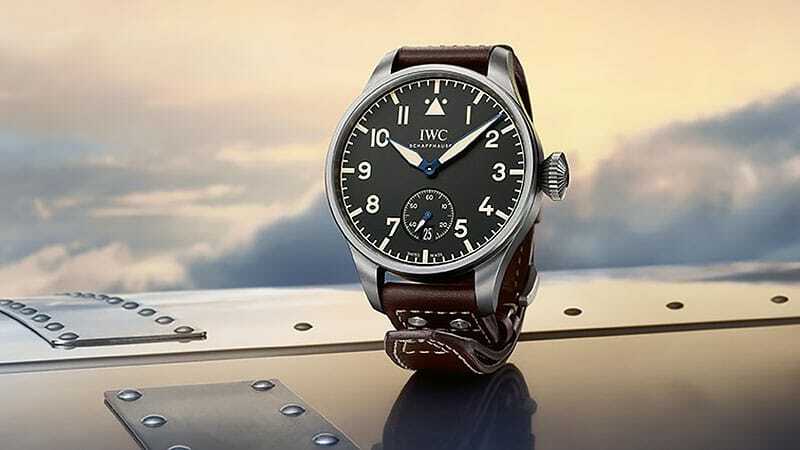 IWC wasn’t kidding when it said the Big Pilot’s Heritage Watch 48 will set the pulses of watch connoisseurs racing. With its ‘unmistakable visual features’ and convenient 192-hour power reserve that guarantees accurate time for eight days before it automatically stopping, this timepiece is an excellent choice. The watch also features protection against magnetic fields. A novel nod to aviation, the hands of this model are propeller-like and beige in colour, offering a classic aesthetic for such a modern watch. With an exclusive SuperQuartz movement and original functions tailor-made for pilots, the Exospace B55 is particularly noteworthy for its features, but its look is also just as appealing. 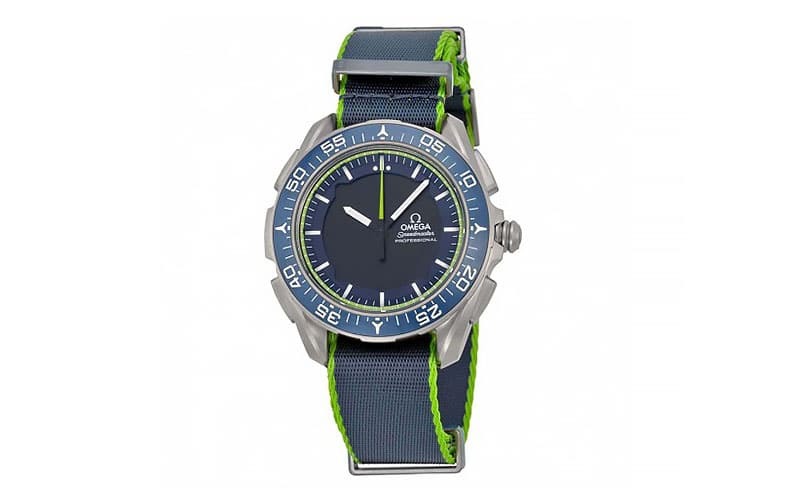 Colour-wise, it is visually bright and vivid, with bold black and neon cobalt features, making this timepiece ideal for the man who prefers something a bit more striking on his wrist. The brand describes it as future-oriented and optimally comfortable to wear. The Bell & Ross Collection Aviation BR is a high-tech chronograph with a sporty design, which is as robust as it is sophisticated. 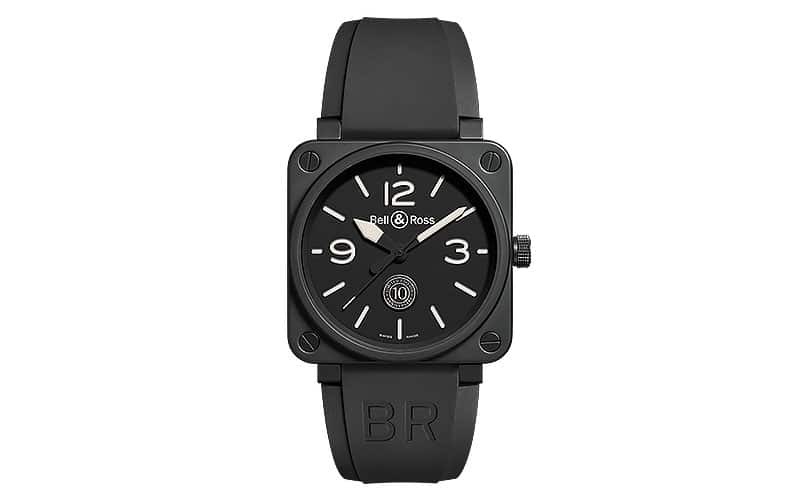 The square face designed was inspired by aeronautical instrumentation, what they call the ‘ultimate reference point for legibility and reliability.’ Black rubber and heavy-duty synthetic fabric straps make this one of the most durable models, reaffirmed by its satin-brushed steel case and screw in crown. The Longines brand has not only executed a cheeky play on words in the name of The Longines Avigation model but also have perfected this watch’s powerful movement and functions, including self-winding mechanical movement beating at 28’800 vibrations per hour and providing 48 hours of power reserve. The bracelet is alligator strap in a distinct black tone, and its dial is black-matte with painted Arabic numerals. Silvered sandy hands complete this timepiece, making it a wise choice for men who wear a lot of black and love a good classic design. The Citizen Skyhawk A-T redefines aviator-inspired timepieces and atomic timekeeping with an intricate design and radio-controlled accuracy perfection. Thanks to this watch’s innovative design, it receives radio signals both automatically and on-demand, providing superior precision. That’s not all it can do, though. This impressive piece of technology also boasts Eco-Drive power, a 1/100-second chronograph, which measures up to 24 hours, a perpetual calendar, two alarms, a 99-minute countdown timer, UTC display, power reserve indicator, and rotating slide rule bezel. 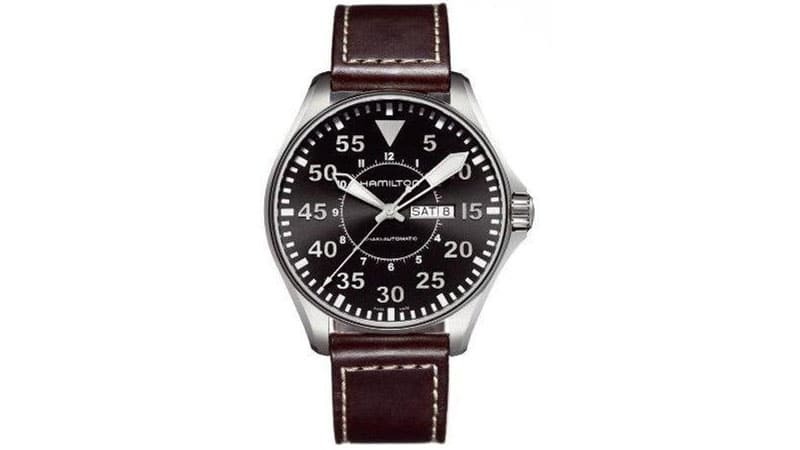 While the H64715535 Khaki Pilot Watch from Hamilton features plenty of practicality, such as with its automatic movement, luminescent hands and markers, and 200 metres of water resistance, it’s its design that makes it a must-have item. 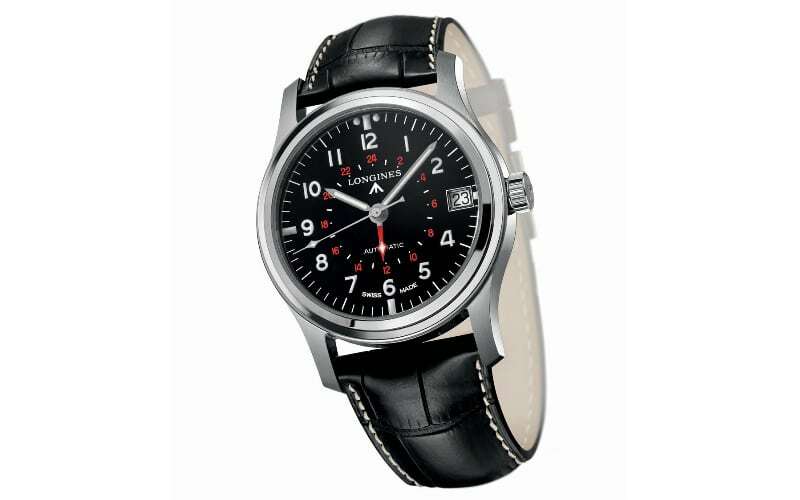 Boasting the kind of a classic aviator style for which pilot watches are known, this timepiece is sleek and stylish. 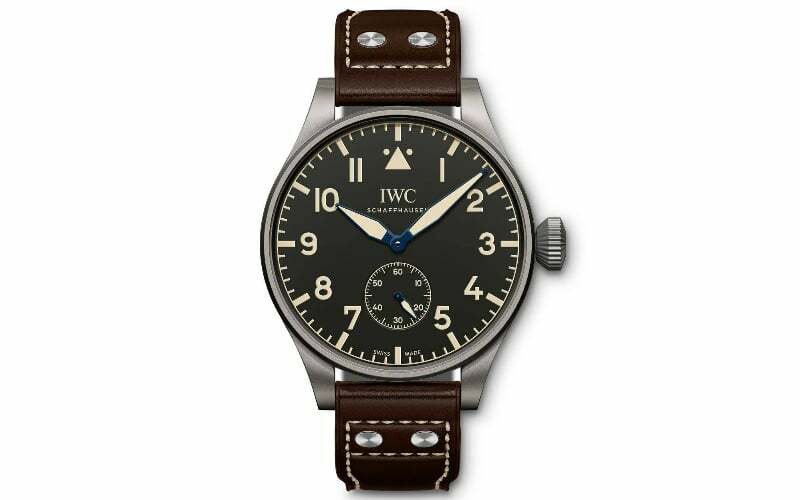 It features a 46mm stainless-steel case, which is complemented by a dark brown leather strap, a black dial, Arabic numeral minute markers, a subdial with hour markers, date and day display, and an exhibition case back. The Bremont ALT1-ZT/51 has been popular amongst the military squadrons that Bremont has worked with and is an updated version of the previous model. A cleaner dial and new applied SuperLumiNova index markers on the dial are just a few examples of the upgrades. Ideal for travel, the GMT hand combined with chronograph functionality measures seconds, minutes and hours. 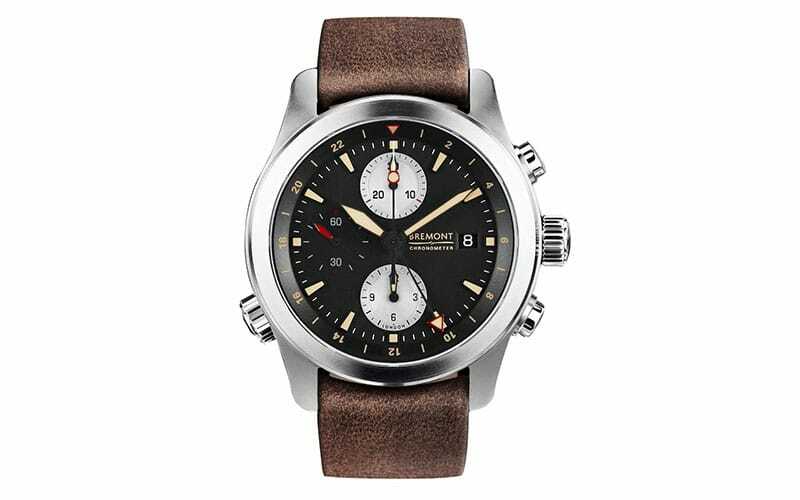 This timepiece also fits well with the Bremont brand’s identifiable signature style. 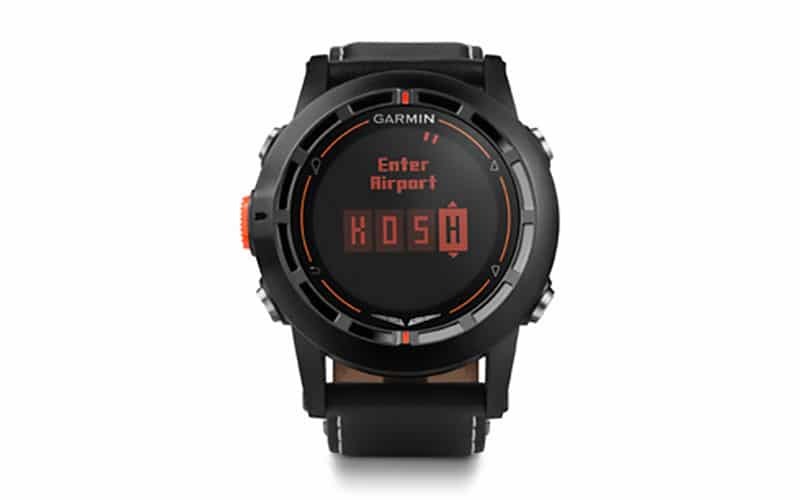 The Garmin D2 wirelessly receives a flight plan from the Garmin Pilot and controls VIRD. It also has various timers and vibrating alerts. Direct-to and Nearest buttons also allow you to use a worldwide airport database. 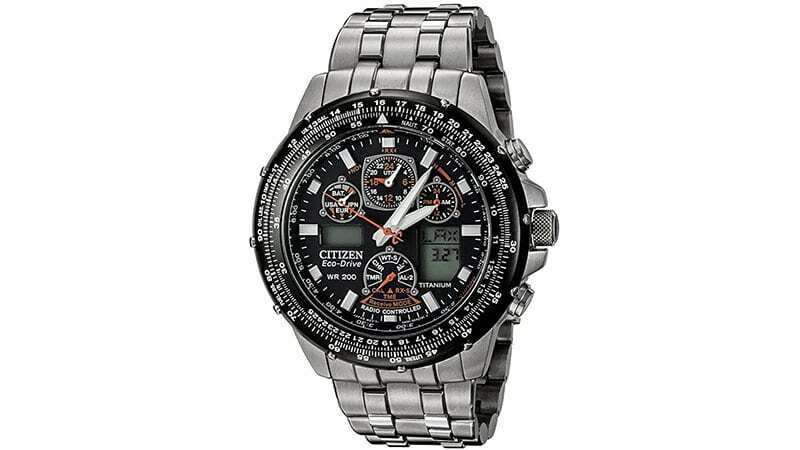 An altimeter with adjustable barometric setting and compass also make this an appealing choice for those after a pilot watch with lots of features. The brand insists that it is the first pilot watch to help you in-flight, possessing a high-sensitivity WAAS GPS receiver. Displays and timers are also customizable, making it an excellent choice for those who want to personalise their watch for their specific needs. 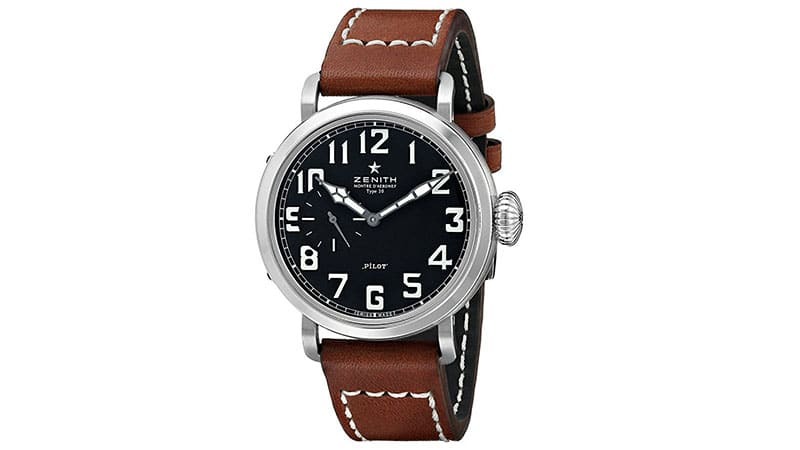 The Zenith 031930681.21C Pilot Watch is as stylish as it is functional. The timepiece features an elegant brown leather strap with cream contrast stitching and a stainless-steel case. The dial is black and boasts luminescent silver-tone hands, easy-to-read Arabic numeral hour markers, and a small, seconds sub-dial at the 9 o’clock position. Although the design is reason enough alone to buy this wristwatch, a Swiss automatic movement completes the package and ensures excellent timekeeping. Apart from the awesome Star Wars reference in its name, the Omega Speedmaster Skywalker X-33 should be noted for the fact that it was the result of a collaboration between the Omega brand and the Solar Impulse Project. The Project has an ambitious aim to circle the globe in an aeroplane powered only by the sun. With skeletonized hands, iPad application, lightweight design and onboard reliability, this watch is certainly an alluring option if you’re after a pilot watch with a lot of features. The Laco Paderborn Watch, which was inspired by the original WWII Laco Pilot watches, boasts a time-tested Swiss ETA 2824-2 automatic (self-winding) movement. As such, this top timepiece is incredibly precise and keeps time accurately. Its design features thermally blued hands and dial markers treated with Super-LumiNova C3 for excellent readability in the dark. Although a modernised version of the original, this Laco watch keeps with tradition and maintains and uncluttered dial by forgoing a date display. 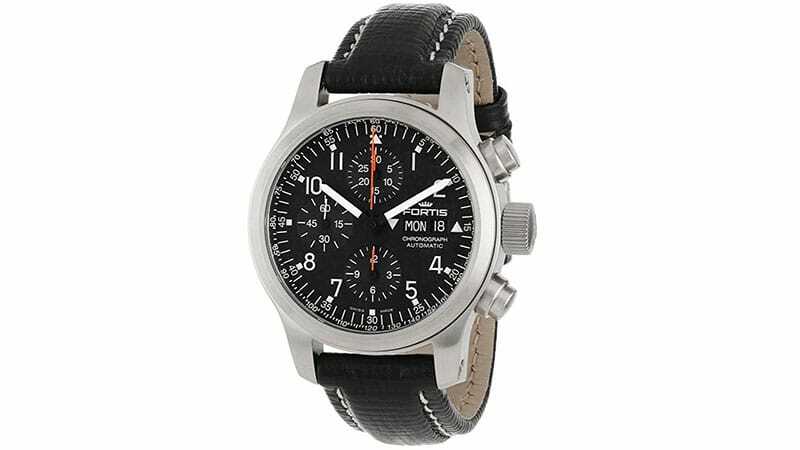 If you’re looking for a pilot watch with plenty of features, the Fortis 635.10.11 L.01 B-42 may just be what you need. This incredible timepiece comes complete with just about everything you could ever need. The watch, which features a Swiss automatic movement, boasts a chronograph, three subdials, a tachymeter inner bezel, and a day/date display window. On top of all that, it also features an anti-reflective sapphire crystal dial window and is water resistant to 200m. 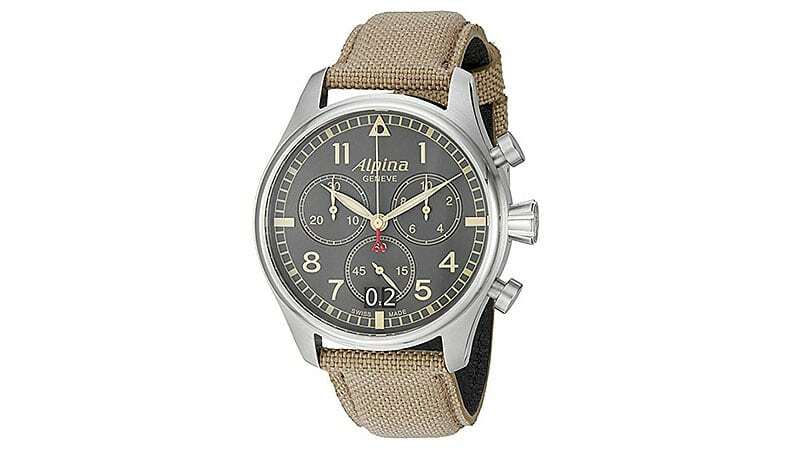 Pilot watches are made with precision in mind, and the Alpina Startimer Pilot Big Date Watch is no exception. The timepiece features a highly accurate Swiss quartz movement with six jewels and 48 months of battery life. 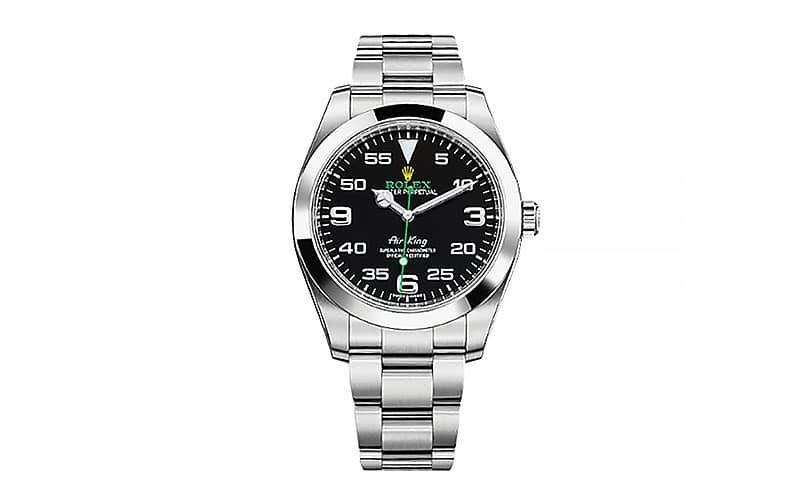 The design was born from Alpina’s century-long experience in building pilot watches for the continental air forces and fits all military aviation watch specifications. The Rolex brand is synonymous with classic styling and contemporary luxury. TRolexperpetuates the aeronautical heritage of the original Rolex Oyster but includes some newer, more alluring features. Something most noteworthy about this watch, however, is the distinct black dial with silver hands and touches of emerald green. It adds to the watch’s character and incorporates classic elements alongside newer technology.